Formerly Jenny Buechel of 9&10 News is the Media Relations Manager at Traverse City Tourism (TCT). Jenny brings four years of entertainment television narrative and media experience to TCT. She and her husband Austin are newly married and renovating the smallest house on Washington (you know the one). R.J. was the summer 2018 Marketing Intern for Traverse City Tourism. He is a senior at Hope College, majoring in Communication. In his free time, R.J. loves to be outdoors hiking or fishing, reading a book, or attending a sporting event. In Spring of 2018, RJ spent the semester studying abroad in Prague, the capital of the Czech Republic. When you’re in a pretty great place, you tend to drink some pretty great stuff. And here in the land of 40+ wineries and tasting rooms, you know that the vino is no exception. 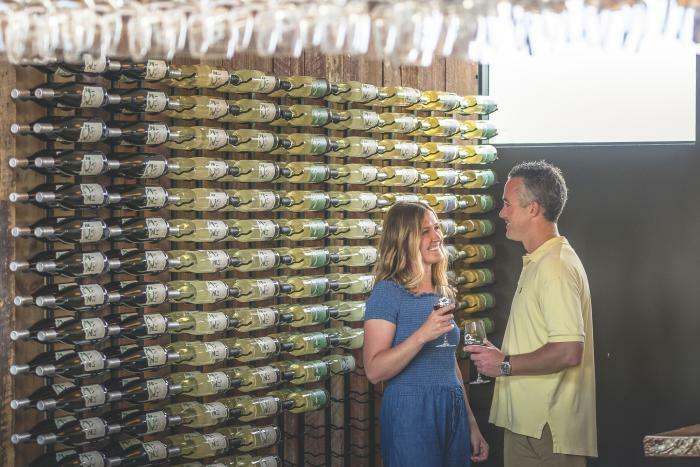 Over the last 15 years the Leelanau and Old Mission Peninsula wineries have exploded in popularity, honing global attention and furthering the story of the Traverse City region. Recently the peninsulas have joined forces to promote their craft under one name, Traverse Wine Coast. We sat down with Paul Hamelin, owner of Verterra Winery in Leland, to learn more about the Traverse Wine Coast…and maybe sip a little red.